On balance, being a Star Wars fan has lately been somewhat more exhausting than parenting my girlfriend’s four kids. It’s easy to forget that, what with this new, glitzy age of competently directed blockbusters courtesy of Disney’s stewardship of the franchise, but you never have to wait long for a reminder. 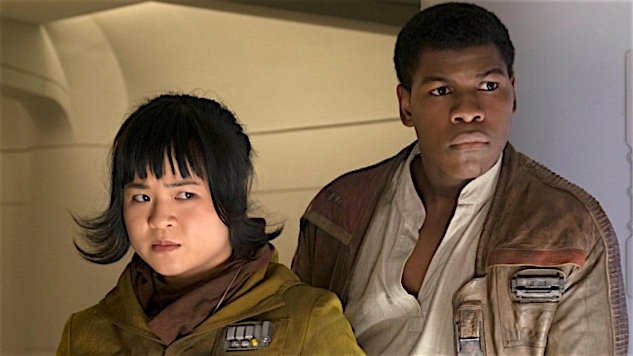 Consider this past month’s news that Kelly Marie Tran—the actor who portrays newcomer Rose Tico in The Last Jedi—has deleted her Instagram posts in the wake of vile comments on them. As of this writing, Tran hasn’t issued a statement, but we’re talking about her interactions with the same fandom who has driven Daisy Ridley off Instagram in similar fashion and which tormented Jake Lloyd, the guy who portrayed a young Anakin Skywalker in The Phantom Menace and who, I should point out, basically just did what his directors told him to do. There is a growing—in intensity if not in actual numbers—wrongheaded and inexplicable part of the fandom’s very worst members, all of whom seem to be aggrieved at the very idea that this sandbox of space wizards and mechanically unrealistic starcraft is now being infiltrated by girls and minorities. It’s something Kevin J. Anderson—author of books that basically continued the Star Wars story between the original trilogy and the movies’ return in 1999 and beyond—has wrestled with. And before anybody starts agitating about the works of Anderson or his contemporaries being a part of the discontinued “Legends” canon, please take a seat. We’re talking about the Star Wars mythos and fandom, the shared conception all fans have had since 1977. All that stuff is part of the phenomenon, just like Adam West is part of Batman and Christopher Reeves is part of Superman, despite anything Warner Bros. may currently be rebooting. Star Wars , the original three-film phenomenon of the late ’70s and early ’80s, was a straightforward story of good vs. evil. A lot of the deeper meaning behind it has been read into it during the intervening years and then added to by dozens of other creators—like Anderson—who have been handed some corner of the Galaxy Far, Far Away to fill in with their own dreams. So let’s look at what they had to work with and how they’ve built upon it. Star Wars is rooted, inextricably grounded, in a post-World War II sensibility. It knows who its bad guys are and who its good guys are, even if it’s too focused on the lineage of its main characters or the loving shots of its bombing runs to stare too closely at everybody’s respective ideologies. It doesn’t have to because you know and I know what they are: The Empire represents brutal fascist heavy-handedness and all the callous violence that implies, and the Rebellion represents freedom and justice and openness for all peoples. There was not a single woman or minority (human or alien) among the arrogant officers or dull and disinterested stormtroopers of the Empire in the original films, but the Rebellion was happy to have them. And why should this not have been the position of a good vs. evil action adventure film conceived by a man born in 1944? When Timothy Zahn was tasked with writing his landmark Star Wars novel trilogy that began with Heir to the Empire in 1991, he created the Grand Admiral Thrawn character—an alien from a species called the Chiss and a tactical genius who emerged to menace the fledgling New Republic that had arisen in the five years since the Rebellion’s triumph over the Empire in Return of the Jedi. He is perhaps one of the most enduring characters of the Expanded Universe—so beloved by fans that he’s been brought back into the official canon by appearing as a chief antagonist in the Star Wars: Rebels cartoon (which I don’t like all that much but whose creators I haven’t harassed or threatened). Aside from being a theatrical and menacing villain, he also hammered home an important point about the Empire. Characters in Zahn’s trilogy of novels remark upon the fact Thrawn must be an exceptional tactician indeed to have risen in the ranks of the Empire because Emperor Palpatine was a known xenophobe who ran a government and a military predicated on racial purity. Where on Earth could Anderson and Zahn and their contemporaries have gotten such notions? Anderson’s works include the Jedi Academy trilogy, which introduced readers to some of the inner workings of the Empire’s vicious military machine. Incidentally, they also introduce us to several other female characters. The female, alien character Qwi Xux was a captive superweapon designer. The female human character Admiral Daala was a ruthless antagonist marshaling the shattered remains of the Empire’s military machine to oppose the New Republic that the Rebellion had set up. Like Leia before them, (and, oh yeah, like Rose and Rey) they have goals and motivations and narrative agency. Zahn’s work was also the one which gave the world Mara Jade, the female assassin in the Emperor’s employ whose fixation on vengeance against Luke Skywalker eventually gave way to her marriage to him. The fact he viewed complex female characters as lacking in the movies—and the fact fans and geek news outlets are still breathless at any mention of her in the same sentence as official Star Wars canon—tells you all you need to know about what a need this has fulfilled for fans. Yes, that’s a female character who has appeared in badass videogames, novels and fan films for decades, all because the Star Wars fandom can’t get enough of her. One of the miracles of the Expanded Universe was its relative consistency, something the authors worked together to achieve, Anderson says. That might be why, as the Expanded Universe kept expanding, that it continued to have such a consistent idea of what made the bad guys the bad guys. Dig deeper and you learn about the Emperor’s pro-human, anti-alien propaganda department based on a fascist nationalist ideology with its own secret police. All of this has shaped the greater mythos of Star Wars for almost as long as I’ve been alive. If that seems incongruous with news of the harassment, the threats, the fan edits of the movies that cut out every woman, the shrieking about how Rey is a Mary Sue or Finn can’t be a stormtrooper because he’s black, the endless sewage leaking out of Twitter from people who evidently have missed the entire message Luke and Leia and all their friends have been trying to get across to us for 40 years, then Anderson, too, expresses bafflement. Kenneth Lowe’s midichlorian count is over 9,000. You can follow him on Twitter or at his blog.